About a year and a half ago, maybe longer, 11 roosters showed up in my neighborhood. They have taken up residence at a vacant house about a block away from me. Nobody seems to know where they came from. All of them except a white one, are black with an iridescent cast with white tufts near their tail feathers. I first saw them wandering about the neighborhood and just assumed someone owned them. I didn’t pay much attention until the white one and one of the black ones started visiting my yard. I named the white one Stanley and the black one Hot Lips, both for roosters a friend of mine used to know. Hot Lips was known for fathering many baby chicks. Now it is Stanley and the Hot Lips because there are five Hot Lips, six roosters total who live on the lot. There are two other Hot Lips in the neighborhood. One apparently left the bachelor party when he took up with a good looking hen. The other appears to stay in the back yard of a neighboring house. I showed some pictures of these roosters to a forest ranger I know. He said they all look like game roosters. Either someone was raising them and moved away or somebody must have dumped them. I got some chicken feed and have been feeding them for about two months now. Somebody puts water out for them. They started to recognize me and would run to me when I brought them the feed. Sometimes they would even come to my house if I didn’t bring the feed to them. I would immediately take it to the lot so they didn’t start crowing. I think the neighbors around the lot are mostly early risers and don’t seem to be bothered by the roosters celebrating life every morning. What I find most interesting about them is that they all get along. I thought roosters naturally fought, and I would think this would definitely be the case if they are game roosters. But they communicate with each other and with the other two who live further away. A couple of early mornings I have heard them behind a neighbor’s privacy fence. Maybe they sleep there because they feel safe. One morning several flew out and were encouraging the ones still behind the fence to fly out too. I didn’t know roosters cluck like hens, but they were clucking back and forth until they were all together again. Last weekend they got traumatized by something. I found them hiding in the brush with one lookout sitting at the edge. They were very skittish. At first I only counted 4 Hot Lips and feared something had happened to one of them. Something definitely went after them because one is missing his tail feathers. This morning I counted all 5 Hot Lips! Yay! They are still very skittish. Maybe this is better for them. As resilient as they are, they live in a hostile environment with potential predators in the form of raccoons and possums. A fox has been sighted in East Hill, and some people say there are coyotes. There are probably also humans who would like to see them gone. I’m having to learn to live in the present, not get too attached, and enjoy their celebration of life on a daily basis for as long as they are my neighbors. I am learning so much from them. 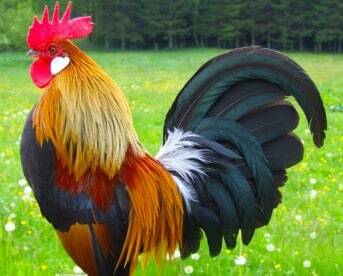 If fighting roosters can live together harmoniously, why can’t we humans?